Publisher: Ecco Pr, New York, New York, U.S.A.
Penzler Pick, April 2000: It is surprising and shocking to realize that Joyce Carol Oates, one of the great writers living today, has never made The New York Times bestseller list (at least not in recent memory). Far less talented (and less famous) authors have made it while she, in all likelihood not caring much, has been shut out. That could easily change with her new novel, Blonde, which may be the masterpiece of a staggeringly distinguished career. This 700-plus-page tome is based on the life of (you guessed it) Marilyn Monroe. In fictional form, with names changed (husband Joe DiMaggio is referred to as "The Ex-Athlete," Arthur Miller as "The Playwright," John F. Kennedy as "The President," for example), this may be the most accurate and compelling portrait of this beautiful and complex woman that one is ever likely to read. But why discuss it on the mystery page, you might well be asking yourself. It was the author's intent to structure the book as a mystery, and of course she succeeds, as she seems to succeed at everything she attempts in the world of letters. And there is a murder, apparently arranged by a secret government bureau (FBI? CIA? ), although that could be the victim's hallucination. Of course, it could also be both real and hallucinated (remember, even paranoids have enemies). 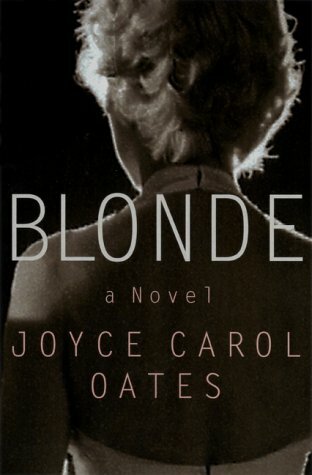 If you like biographies, you'll like Blonde. If you like novels, you'll like Blonde. If you like mysteries, you'll like Blonde. And if you fear that more than 700 pages by one of the greatest of living literary lions might be tough slogging, here's a little excerpt from the chapter titled "The President's Pimp:"
Sure he was a pimp. But not just any pimp. Not him! He was a pimp par excellence. A pimp nonpareil. A pimp sui generis. A pimp with a wardrobe, and a pimp with style. A pimp with a classy Brit accent. Posterity would honor him as the President's Pimp. A man of pride and stature: the President's Pimp. At Rancho Mirage in Palm Springs in March 1962 there was the President poking him in the ribs with a low whistle. "That blonde. That's Marilyn Monroe?" He told the President yes it was. Monroe, a friend of his. Luscious, eh? But a little crazy. Thoughtfully, the President asked, "Have I dated her yet?"